In the February issue of Clinical Biomechanics, researchers at the University of New Brunswick in Fredericton, New Brunswick, Canada, published what they describe as the first comprehensive analysis of 3-D joint and muscle gait patterns in children with autism. The study found that a group of autistic children, compared to controls, had a significantly higher cadence, increased upper flexion of the ankle in swing phase, decreased peak ankle joint angles, and significantly smaller peak plantar reflex moments. The study included 12 children with autism, ages 5 to 9, plus 22 age-matched control participants. However, the researchers excluded toe-walkers and children with Asperger syndrome or pervasive developmental disorder not otherwise specified (who typically would fall under the definition of full autism spectrum disorder [ASD]). Many children with ASD have sensory sensitivities that make them behave less than ideally when researchers use markers, tape, and Velcro to capture patterns for wave form analysis, explained senior author Victoria Chester, PhD, associate professor of kinesiology at UNB’s Andrew and Marjorie McCain Human Performance Laboratory. “We were successful in getting them through,” she added, probably because of the exclusion of some children from the study. The researchers used an eight-camera motion capture system to track 3-D trajectories of reflective markers placed on the children’s skin. They used custom software to compute cadence, velocity, and percent cycle spent in single limb stance for every gait cycle. They used parameterization techniques and principal component analysis to analyze their data and then compared the two sets. So what do the study results mean to practitioners? Whether gait pattern analysis could be used to screen for possible autism disorders is a “huge topic, very controversial,” Chester said. And while some people are looking into that possibility, it was not a focus of the UNB research, she said. Dawn-Marie Ickes, PT, a physical therapist at Core Conditioning PT in Studio City and Burbank, CA, agreed that gait analysis screening is not close to being ready for prime time. Although other symptoms and aspects often are given priority when managing autism, Chester encouraged practitioners to remember that there is a physical component to autism as well, making it necessary to treat the whole child. “A child who can’t keep up with others on the playground from a motor perspective is also affected socially,” she said. 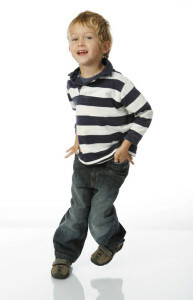 Larger studies are now needed that include children from all autistic-related groups, Chester said, to facilitate an understanding of how gait differs across the autism spectrum. Larry Hand is a writer based in Massa­chusetts.